Are We Ready For Sunshine!!! I don’t know about you, but I’m ready to see the sun! According to the forecast, it might stick it’s head out here tomorrow afternoon. Plus, temperatures will be in the mid 60s. Yes to all of the above. Saturday, it looks like sunshine all day and again, temperatures in the mid 60s. Unfortunately, Sunday’s forecast says light rain early. Not so bad if we get the sun Friday and Saturday. Generation schedule continues to be two to four generators on in the morning for three to four hours then off until late afternoon. Wednesday had that projection, but they ran water all day except for two hours in the afternoon. Today is the normal on for a while, off, then back on this afternoon. Although they were supposed to only have two units on for one hour, they actually ran one or two units for four hours. It is now off and dropping. Wednesday Jim out with Gina yesterday. Despite the erratic generation, they had a very good day on the ruby 2 and an egg pattern. Kind of a cloudy, misty day, but it was worth it. 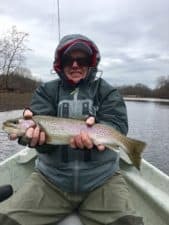 This entry was posted on Thursday, January 19th, 2017 at 11:39 am	and is filed under Fishing Reports. You can follow any responses to this entry through the RSS 2.0 feed. You can leave a response, or trackback from your own site.